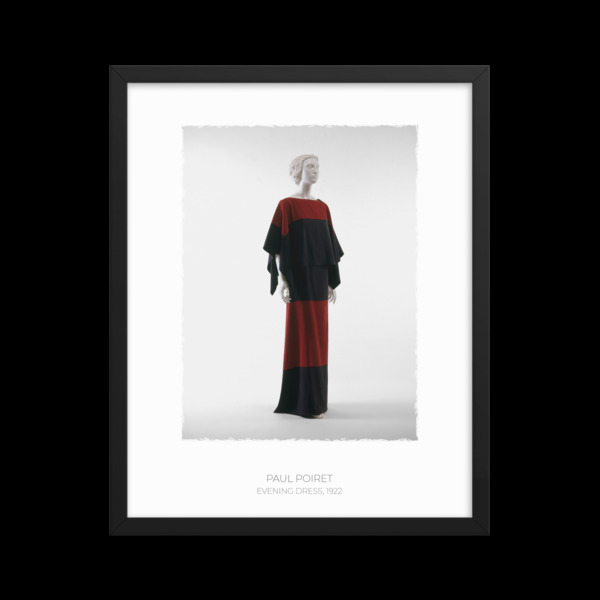 During the first decade of the twentieth century, Paul Poiret initiated a fashion sea change when he declared the wasp-waisted silhouette outmoded, and the columnar form of high-waisted Directoire-Revival gowns the vogue. This jettisoning of the corset alone established Poiret as among the most important and influential designers to this day. In this two-piece dinner gown, Poiret's interest in the "liberating" style and cut of non-Western regional dress results in a peplos-like ensemble. Two separate but identical squares of cloth, one worn like a short poncho and the other wrapped into a cylindrical skirt, create a peplos effect with its apoptygma-style top. Although the ensemble is not constructed like any classical Greek precedent, the use of cloth, completely orthogonal as if off the loom, suggests an affinity to the simply configured garments of the ancient world, which were also formed out of rectilinear pieces of cloth scaled to their intended use directly on the loom. This interest in the nontailored traditions of much regional dress was not restricted to Poiret, nor was his conflation of classical styles with ethnographic forms. Madame Grès is perhaps the best example of the phenomenon, but Cristobal Balenciaga, Valentino, Issey Miyake, and Romeo Gigli, among others, have all made Greco-Roman allusions through minimalist constructions based on clothing traditions outside the Western fashion system.